We’ve been accepted for a performance with our garments at the Vector Game + Art Convergence! 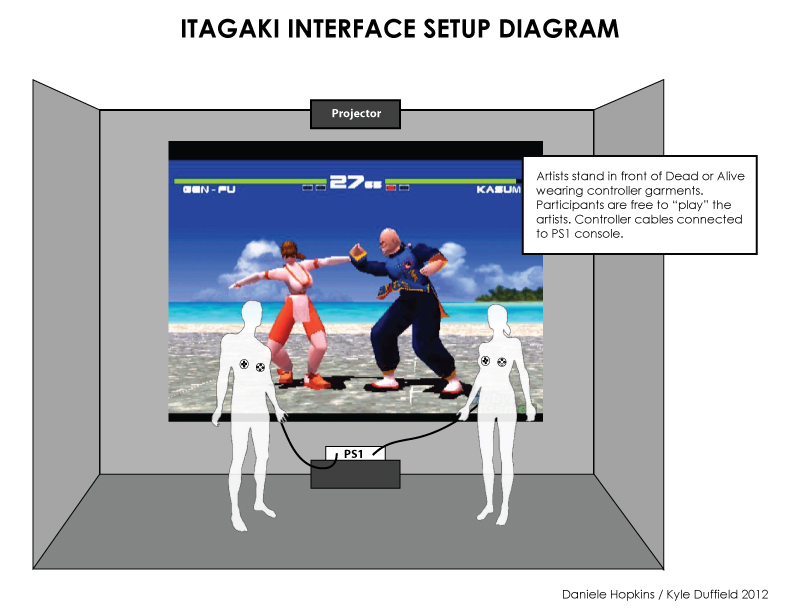 Itagaki Interface is both a playful interactive performance piece and a social experiment that aims to complement and contrast the content of “Dead or Alive” (DOA) through the tactile manipulation of the PS1 interface. 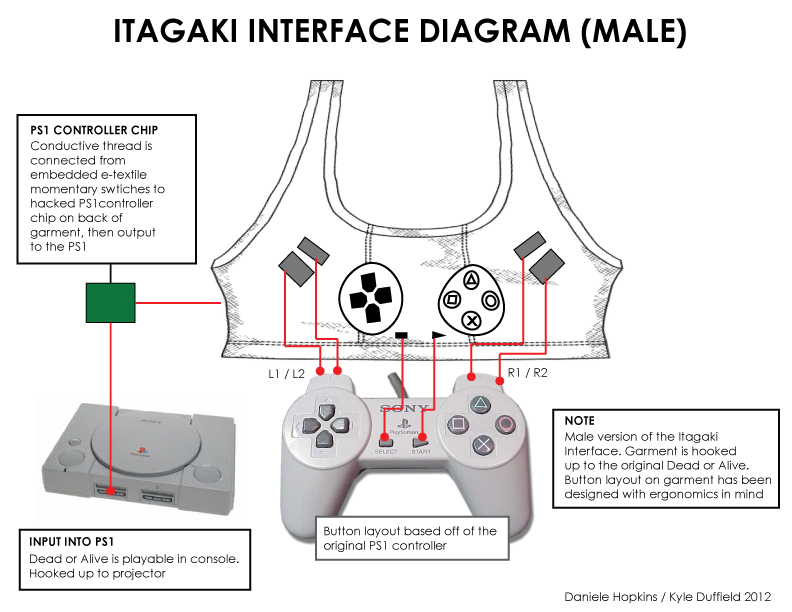 Itagaki Interface features two performers/artists acting as female and male “controllers,” each wearing a hacked PS1 controller bra/bro. The controllers are connected to the first installment of DOA, the beginning of the Tecmo-saving franchise created by Tomonobu Itagaki, which was renowned for its impossible-looking implementation of the series’ controversial trademark breast physics. The game is projected so that the characters in the game are relatively life-sized, with both artists standing static in front of the screen. Participants are invited to “play” the artists, free to select either a male or female controller (versus or single player), and subsequently, a male or female fighter within the game. Face to face with the artists, participants engage with awkwardly tangible human intimacy while controlling a now archaic 32-bit representation of fantastical and sometimes oddly bouncy bodies. Both male and female artists are used to reflect the selection behaviour supported by the game’s fighter choices. 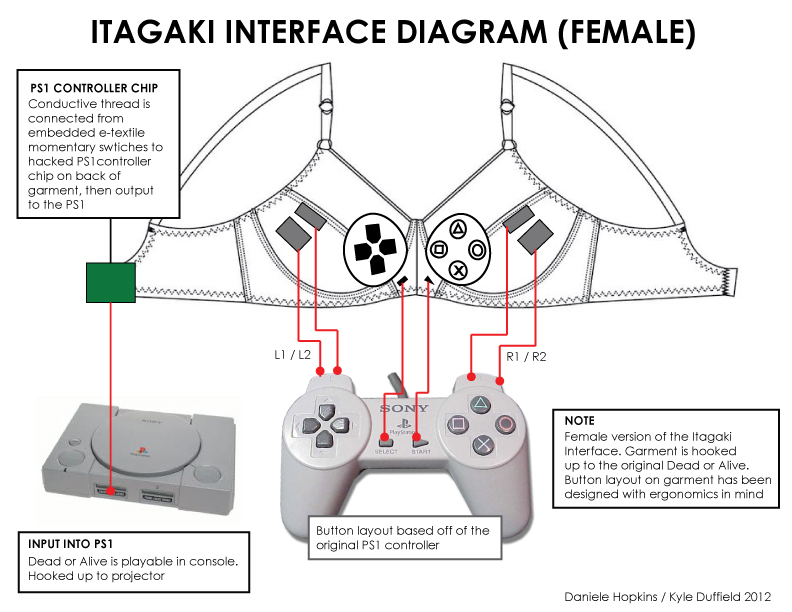 This piece questions general assumptions about the willingness of the game’s target audience to face the contrast between reality and fantasy in relation to assumed preference and comfort level when confronted with real-life physical interaction through either a male or female “interface.” Itagaki Interface is meant to be an open forum that acknowledges both the controversy and success of DOA’s highly sexualized characters by giving gamers the opportunity to directly address the source of the controversy — how gamers interact with sexuality in both digital and physical forms when presented simultaneously.